Now, here is a seriously last-minute decor project that will bring a little garden to the table. 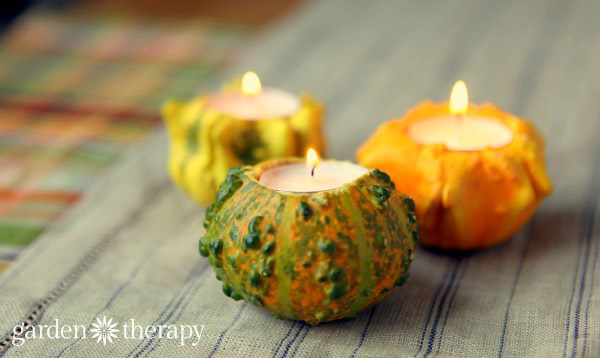 These ornamental gourd candle holders are elegant, cozy, fun to make, and surprisingly long-lasting. Gourds are a much harder version of winter squash and pumpkins, making them perfect for decor that can hold its own for the holiday season. Bumpy, colorful gourds can be found in most any grocery store or garden center in the fall, but they are also very easy to grow. The growing time is very short and the fruit produces quickly. A lesson that I learned a few years back when I had some volunteer squash plants growing in my flower garden. The “volunteers” come from seeds that have not fully broken down in my compost. When I dig the compost into the garden, the seeds germinate and little squash seedlings pop up all over the garden. I don’t mind them at all. In fact, I allow one or two volunteer squash grow out onto the lawn each year, and revel at the surprise when the fruit forms. Follow these instructions for Growing and Harvesting Pumpkins over on my blog at Angie’s List. Growing Cucurbita ornamental gourds is essentially the same, but with a bit more of a manageable plant size. There are two types of ornamental gourds, Lagenaria gourds (bottle gourds) that are typically used for birdhouses and other decorations, and gourds from the Cucurbita family, which also includes squash and pumpkins. I’ll write about Lagenaria gourds in a future article as I have a few outdoor projects to share using them. The weird and warty gourds that I use for fall decor indoors require little else than selecting the most interesting-looking shapes and colored fruit for your projects. This project can be found in my book, Garden Made: A Year of Seasonal Projects to Beautify Your Garden and Your Life, as one of the stylish yet simple fall projects. You can read more about Garden Made here. 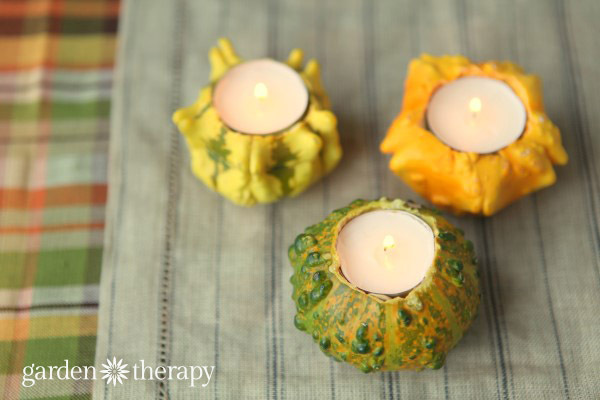 There are two ways that you can make these tea light holders: as a melt-and-pour candle craft or by simply adding in a tea light. 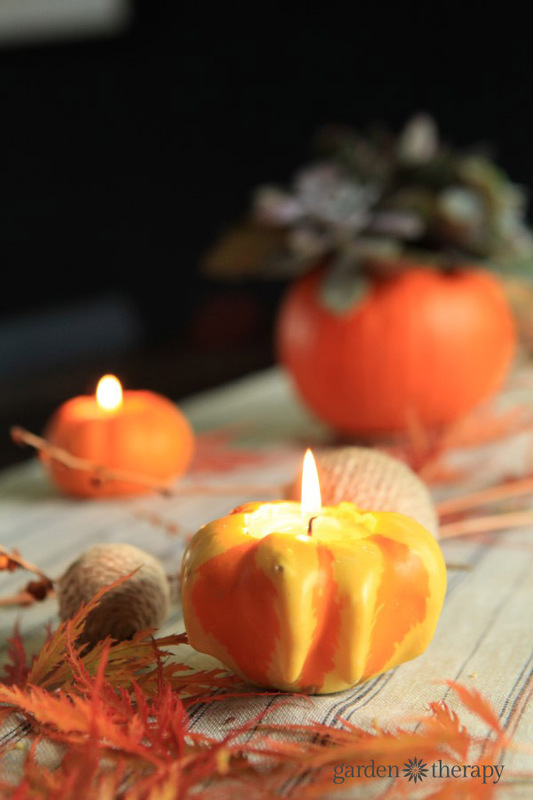 To make them as a melt-and-pour candle craft, follow the instructions for making jar candles or beeswax seashell tea lights and use a hollowed-out gourd or miniature pumpkin as the container. The wax will seal the flesh of the gourd and it will last longer than if the cuts were exposed to air. 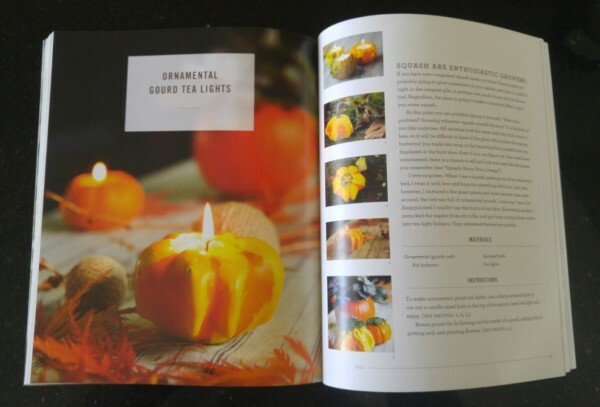 To make a tea light holder, carve out a hole like you would a pumpkin and pop in a tea light. These will start to decompose more quickly than the melt-and-pour option, but they will still last for a few weeks in the right conditions. When they start to soften or show mold, then toss them in the compost bin and make some new ones. 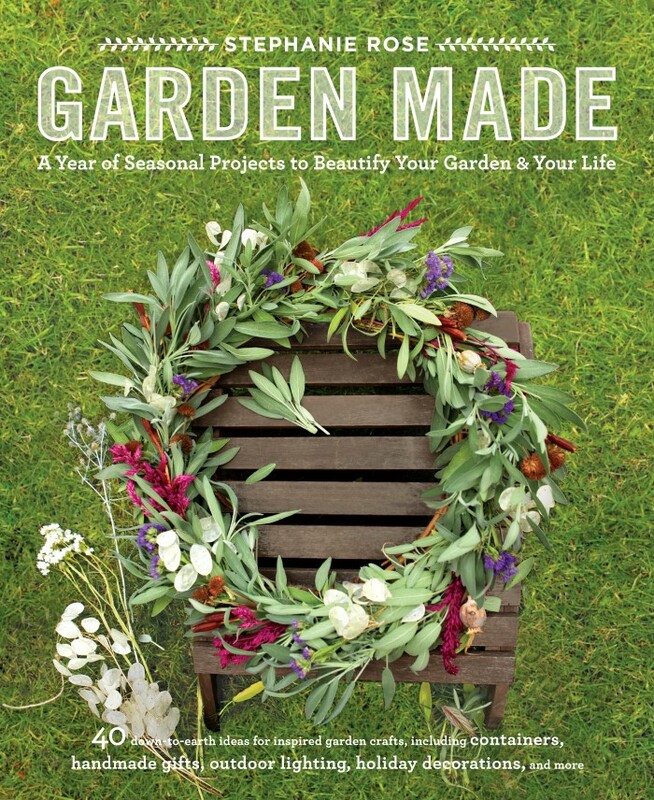 See more gorgeous garden craft projects for every season in Garden Made, a gold-medal winner of an Independent Publisher’s Book Award. Available everywhere books are sold. 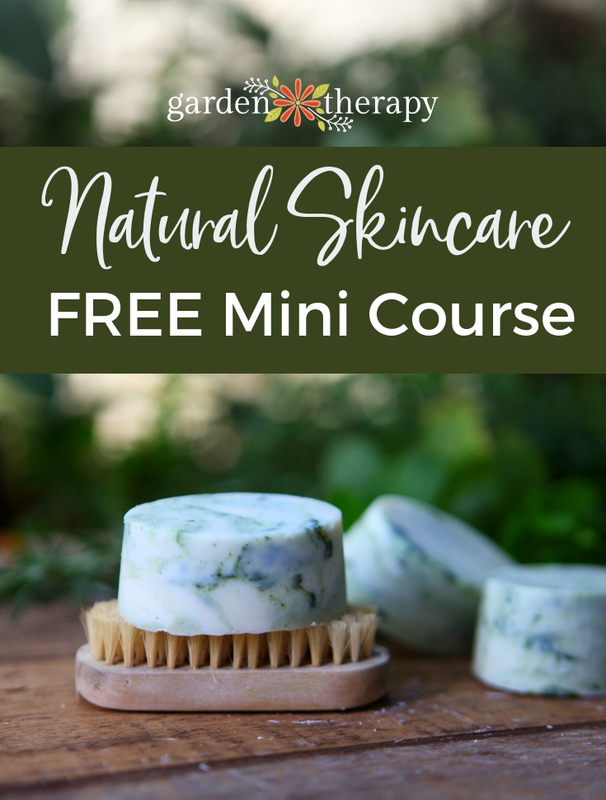 Blending the pleasures of gardening with the joys of crafting, Garden Made showcases over forty projects to adorn your garden, beautify your home, or give as gifts. Following the natural cycle of the garden in all its seasons—yes, even winter!—these garden-inspired projects, made by hand and finished with finesse, are the perfect way to express your love of the garden in fresh ways. 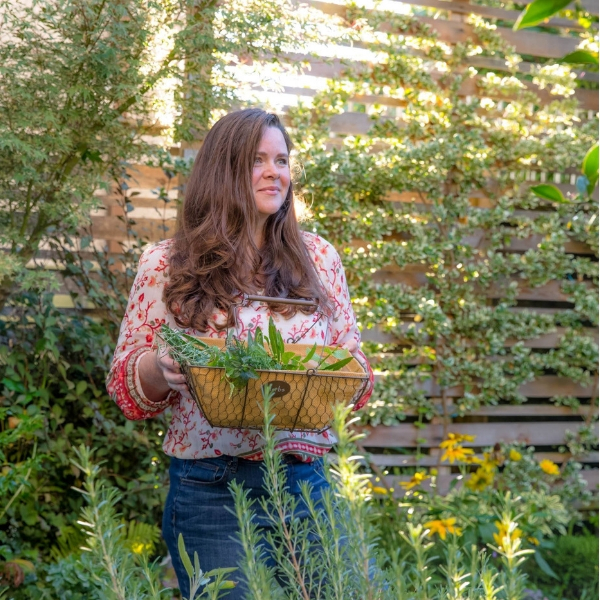 With full step-by-step instructions, as well as gardening tips and advice, Garden Made will inspire seasoned and novice gardeners and everyone in between. Very pretty! Love this idea, such a great decorating element to add in those spots where you just want a little something fall. These are soo cute! Thanks so much for sharing at our link party! Such a pretty idea! Thank you for linking up with us at #HomeMattersParty .See you again next week. So cute! Perfect for fall anywhere.